In 168 BC the Romans defeated Perseus, King of Macedonia, at Pidna and in 148 they established their direct rule over Macedonia, which became a strategic territory for the expansion of the Roman Empire in the Eastern Mediterranean region. 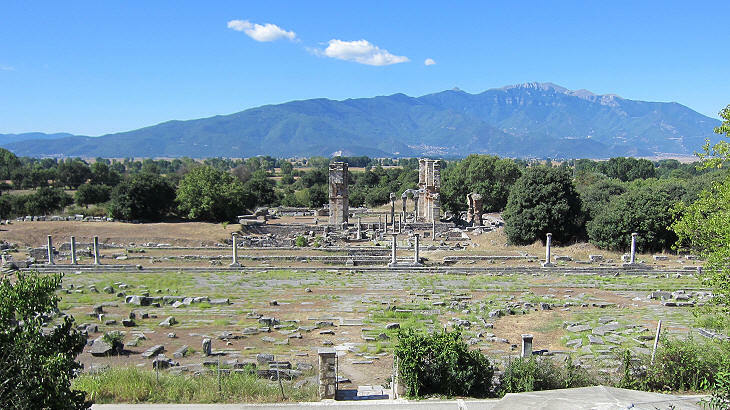 The Romans built Via Egnatia, a road which from the Adriatic coast of today's Albania reached Thessalonica on the Aegean Sea, to speedily move their legions across the mountains of northern Greece; the road was extended eastwards towards Philippi and Byzantium. 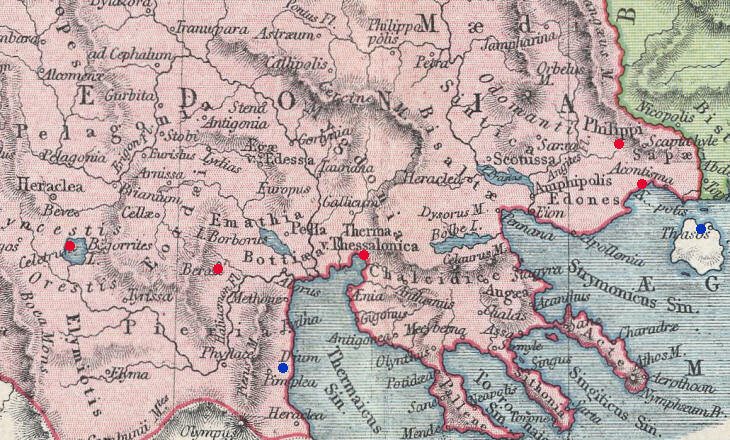 Greece was the battlefield of the civil wars associated with the First and Second Triumvirates; Julius Caesar defeated Pompey at Pharsalus in Thessaly, Octavian and Antony defeated Brutus and Cassius at Philippi in Macedonia and finally Octavian defeated Antony (and Cleopatra) in a naval battle along the coast of Epirus. 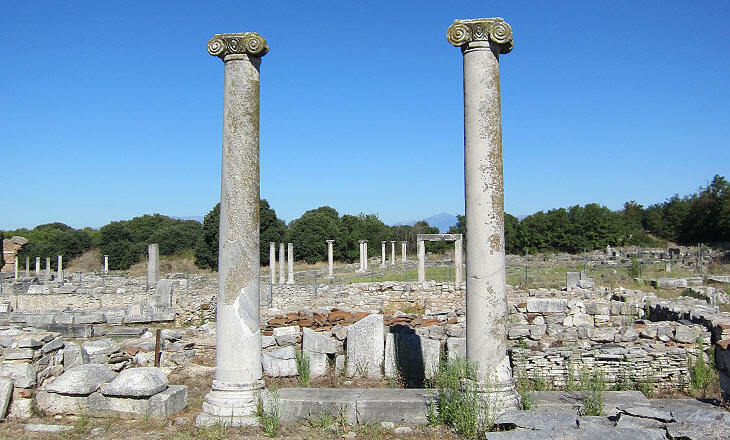 Philippi was founded by Philip II, King of Macedonia and father of Alexander the Great, in 356 BC on the site of a settlement established by the inhabitants of Thassos, an island near the coast of Macedonia. The town controlled a strategic passage and was located near gold mines; the land between the town and Mt. Pangaeum was marshy and this fact played a key role in the battle of Philippi; Antony found a dry path in the marsh through which his troops reached the camp of Cassius; the attack was not decisive from a military viewpoint, but Cassius believed that part of his army had deserted him and he committed suicide (Brutus did the same a few days later). 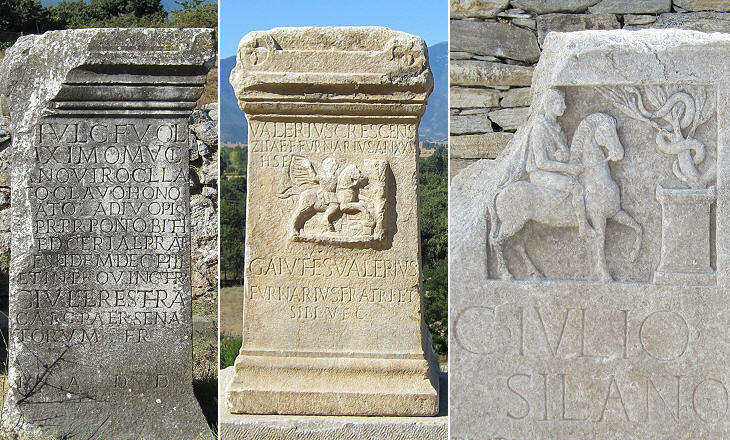 Octavian's military leadership at Philippi was poor, but the young heir of Julius Caesar managed to retain the loyalty of his troops by promising them land and money; after the victory the territory surrounding the town was assigned to his veterans and in 27 BC Philippi was renamed Colonia Augusta Iulia Philippensis. The town was ruled by two officers directly appointed by the emperor and its inhabitants were regarded as Romans living on the Italian peninsula. 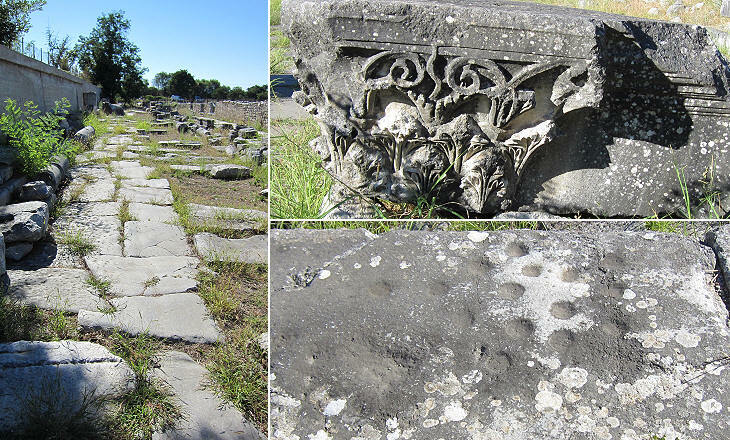 The life of Philippi revolved around the forum, a large rectangular portico along Via Egnatia which crossed the town from east to west; temples and a library were located on its short sides; the long side opposite Via Egnatia bordered on a market; there is little evidence of these monuments due to the fact they were in part utilized for the construction of Christian churches (see page two) and because during the Ottoman rule the site was used as a quarry. 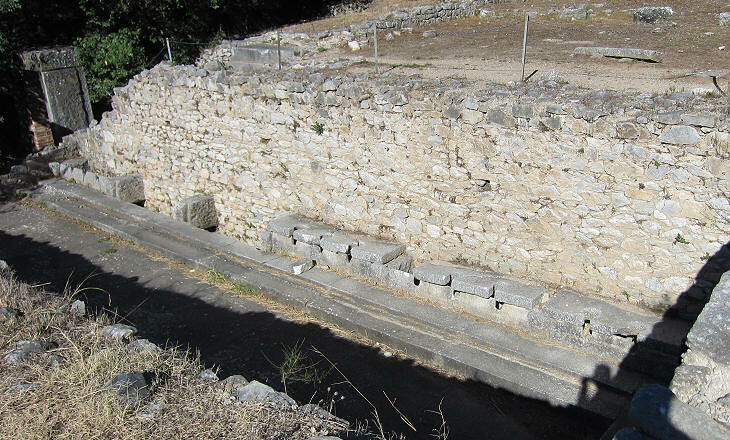 The inhabitants of Philippi exercised in a large palaestra which was located near the market, the larger part of which was occupied in the VIth century by an imposing church; the public lavatories are the only well preserved part of the palaestra. 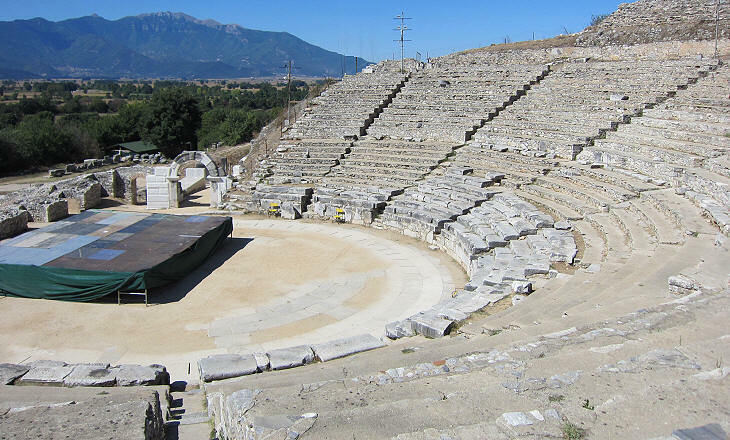 A small theatre was excavated into a hill to the north of the town, probably at the time of its foundation by King Philip II; it was enlarged by the Romans; since 1957 in summer it houses the Filippi Kavala Festival (external link), a series of concerts and plays. 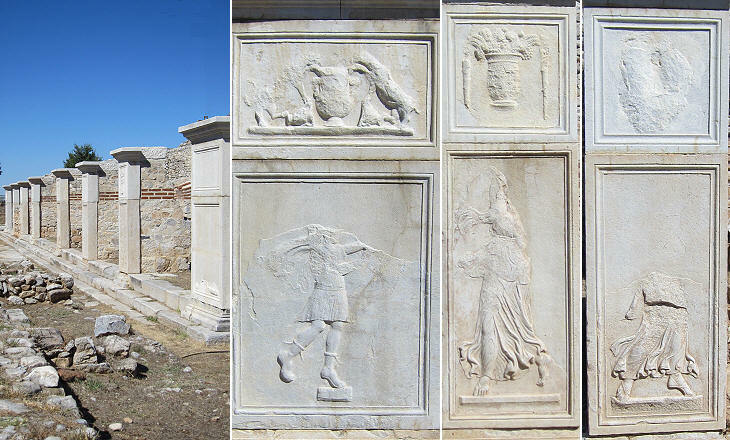 The elaborate reliefs which decorate the front of the theatre indicate that the building was initially used for traditional theatrical performances; in the IIIrd century it was modified to accommodate fights with wild beasts and other similar shows which had become very popular. 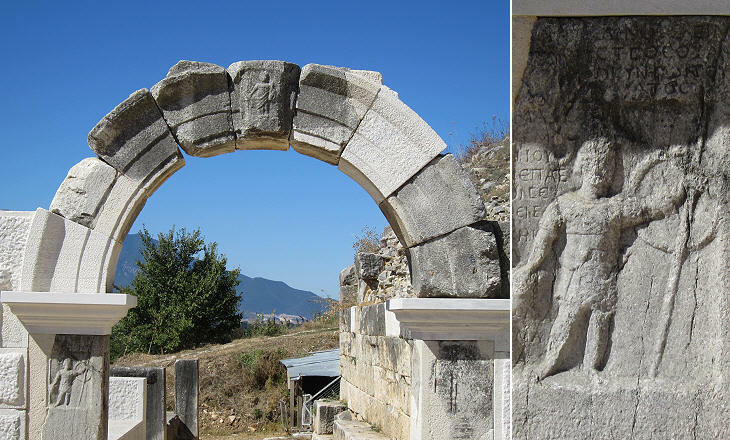 The change of use of the theatre is documented by some poorly executed reliefs such as the one portraying Mars as a gladiator. Philippi retained strong links with Rome and its inhabitants mainly spoke Latin; over the centuries however they were influenced by local traditions and beliefs; most of the tombstone reliefs found at Philippi portray the dead as a Thracian (or Macedonian) horseman, a local deity, which is thought to have inspired the iconography of St. George, although the snake portrayed in the ancient reliefs did not have a negative meaning.